Do you need a Commercial Dumpster? Looking for a Debris Removal Service for your next project? Need an affordable Waste management option? With Wilkes-Barrel Dumpster Rental, we provide affordable Roll off Dumpster Rentals for your next Commercial Project. We have the perfect choices for your Dirt Removal, Trash service, Roof removal trash, and renovations. We are your top choice in Dumpster rental service in the Wilkes-Barre area. With Wilkes-Barre Dumpster Rental, we have many options of sizes in Commercial Dumpster Rentals. The 20 Cubic Dumpster Rental is the most popular size we have. It is perfect for smaller projects, and provides an effective use of space as well as providing adequate room for bigger projects. One of our larger models of Dumpster Container, the 30 Cubic, is perfect for Commercial Renovation. This is the Roll away choice to give you lots of space at an affordably price. The Largest Dumpster Rental available is the 40 Cubic. This massive dumpster is reserved for construction sites and complete renovation overhauls. Perfect for the Commercial Job site. Ready to rent your dumpster today for your Commercial job? We are ready to be your Dumpster Rental choice in Wilkes-Barre and surrounding areas. Call us today - we look forward to working with you! Call us at 570-507-8965. 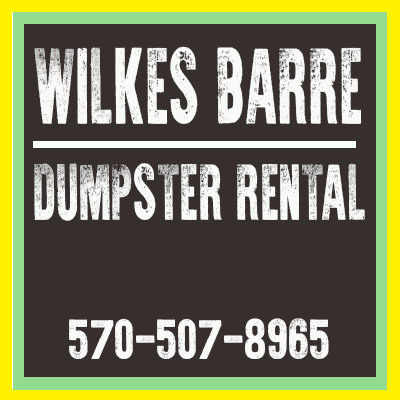 Dumpster Rentals available in Wilkes-Barre, Kingston, Luzerne, Nanticoke, Bear Creek Village, Glen Lyon, Shickshinny, Dallas, Sweet Valley, Harveys Lake, Pittston, Old Forge, Moosic, Scranton, Dickson City, Moscow, Archbald, Clarks Summit, Quicktown, Gouldsboro, Lake Harmony, White Haven, Freeland, Hazleton, Berwick, and all other surrounding areas. We would love to have you use us for your next dumpster rental!